Tectonic interactions between the Pacific, Gorda, Juan de Fuca, and North American plates, and the Juan de Fuca and Gorda oceanic ridges are the source of incremental , long-term coastal uplift and infrequent earthquakes when coastal lands suddenly subside. Tectonic processes, along with long-term cyclical changes in climate and related glacial spread and retreat, have created the bedrock and soil formations found in the project area. Landslide along the Smith River in Oregon. Local geologic formations at Coos Head. Earthquakes and Tsunamis: Of the over 2,100 earthquakes measured off the Oregon coast since 1965, only nine have been a magnitude 6.0 or higher (Figure 3). The strongest of these (magnitude 6.9) occurred in July 1991 (Table 1). The average magnitude of all earthquakes during that time period was 3.5 and the average depth was 10.7 km (6.6 mi) below the earth’s surface. Many earthquakes were concentrated around the Blanco Transform Fault. In contrast, only a few earthquake events were located in close proximity to the project area and those were much smaller in magnitude during the same time period (Figure 4). The largest of these closer proximity earthquakes (2.5 magnitude) occurred just off Cape Arago in September 2012. Stratigraphic investigations conducted over the past few decades have provided evidence that much of the Pacific Northwest coast has experienced significant (magnitude greater than 8) Cascadia megathrust earthquakes and accompanying tsunamis repeatedly over the past 5,500-6,500 years. These earthquakes occurred every 500-600 years on average (varying from a few hundred years to almost 1,000 years)(Kelsey et al. 2002; Witter et al. 2003). For example, soil cores provide evidence for historically reoccurring rapid coastal subsidence events. Cores taken from current-day tidal marshes in the project area show ancient marsh soils (full of organic materials such as march plant roots) abruptly buried by fine intertidal mud when the coastal land mass rapidly subsided during historic earthquakes. Often these abrupt transitions in the soil cores include a coarse sandy layer full of woody debris deposited during earthquake-generated tsunamis. Figure 3: Seismic events between 1969 and 2015. The most recent Cascadia megathrust earthquake (magnitude 9) and tsunami on the Oregon coast (including the Coos estuary) occurred on January 29, 1700, caused by a sudden slip of the Juan de Fuca plate beneath the North America plate along the 1,000 km (621 mi) long Cascadia subduction zone (Satake et al. 1996; Rumrill 2006). This caused the land mass to subside an estimated 0.6 m (2.0 ft) (Leonard et al. 2004). Estimates of subsidence from future mega-thrust earthquakes in Coos Bay range from 0-1.5 m (0-4.9 ft)(Leonard et al. 2004) while maximum subsidence, modeled for this area, could be as high as 2 m (7 ft)(Witter et al. 2011). According to Rumrill (2006), “the probability of a future earthquake and coastal subsidence event is conservatively estimated at 10-20% within the next 50 years (or 20-40% within the next 100 years)”. Lately, seismic activity along the subduction zone appears to have fallen off, leaving the zone “eerily quiet” (Banse 2014). Quoted in several northwest media outlets in December, 2014, Doug Toomey, a geophysics professor at the University of Oregon, said, “all of Cascadia is quiet. It’s extraordinarily quiet when you compare it to other subduction zones globally” (Banse 2014). In 2011, Toomey and other scientists began the Cascadia Initiative, a four-year study in which seismometers were deployed at 160 sites along the entire Cascadia subduction zone to help determine what that silence means. If they find the boundary between the two plates is fully locked, pressure will continue to build until another serious earthquake occurs. “If it is completely locked, it means [the Cascadia subduction zone] is increasingly storing energy and that has to be released at some point.” (Toomey, on Banse 2014). Landslides – which describes areas within the project area most at risk for landslides and debris flows. These four sections are followed by a Background section which provides more in-depth information for each of the sections in this data summary. Plate Movement: The underlying geology of the Coos estuary and surrounding watershed results from the tectonic interactions between the Pacific, Gorda, Juan de Fuca, and North American (i.e., North American continent) tectonic plates, and oceanic spreading from two ridges (Juan de Fuca and Gorda)(Figure 1)(see also Geology Terminology sidebar). Large-scale plate movements (e.g., slip of the Juan de Fuca plate along the Blanco Transform Fault, and subduction of the Juan de Fuca plate beneath the North American plate) have been coupled with localized sea floor spreading along two ridges: the Gorda Ridge at a rate of 2.3-5.5 cm (0.9-2.2 in) per year, and the Juan de Fuca Ridge at a rate of 4.0 cm (1.6 in) per year (Komar 1997; Clague 1997). Along the Oregon coast, pressure from these tectonic movements of the earth’s crust have resulted in the folded and warped outer continental shelf margin and cycles of long-term, incremental uplift of the coastal lands followed by rapid subsidence events (i.e., earthquakes)(Rumrill 2006). Stratigraphic (i.e., study of rock layers) investigations of rock outcroppings by Nelson et al. (1996, 1998) and analysis of the composition and age of buried microfossils indicate that the South Slough tidal basin has undergone catastrophic subsidence of 0.50-1.0 m (1.64-3.28 ft) at least three times over the past 4,000 years, and possibly as many as nine times. Faults and Folds: The chief geological feature of the Coos estuary is the South Slough Syncline, which is an asymmetric fold with steep sandstone and shale on its western side and gently sloping marine terraces on its eastern side, all of which are offset by several minor cross faults (Rumrill 2006; McInelly and Kelsey 1990)(Figure 2). According to Rumrill (2006), “South Slough marks the point where the Cascadia fold and thrust belt comes onshore; north of Coos Bay most compressional structures occur offshore on the continental shelf and slope”. Paleoseismic faults in the project area – or faults that were the source of significant earthquakes (magnitude 6.0 or greater) in the past 1.6 million years – were found almost exclusively in the South Slough subsystem (Figure 2). Similarly, nearly all non-paleoseismic faults and folds in the project area are found in its southern portions (i.e., South, Isthmus and Catching Slough subsystems). Figure 2: Faults and folds occurring within project boundaries. 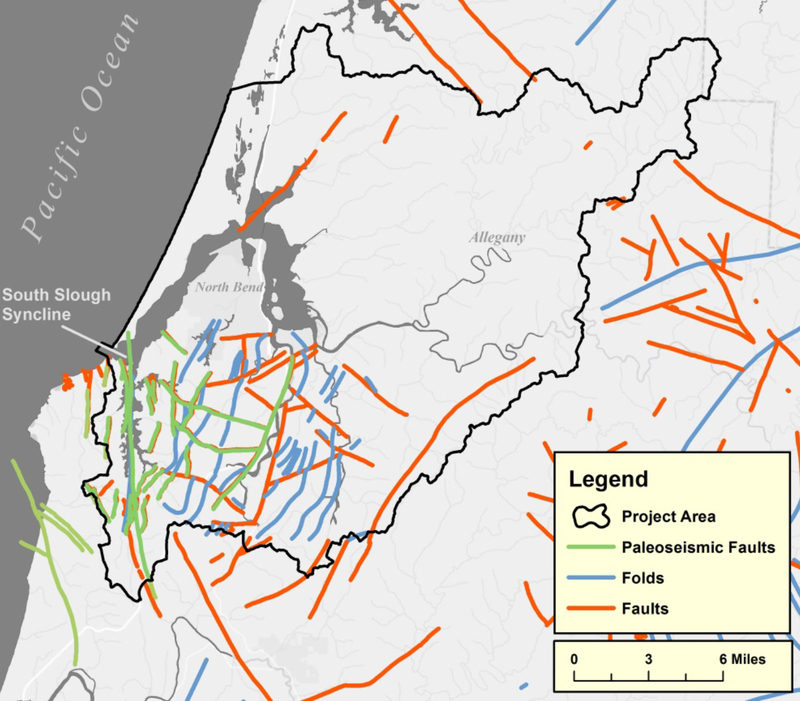 Paleoseismic faults are highlighted, designating faults that were the source of significant earthquake (6.0 or greater) in the past 1.6 million years. Data: USGS 2005; DOGAMI 2009. Tyee and Coaledo formations make up the vast majority of the underlying bedrock in the project area (71% combined)(Figure 5). Both formations are sandstones with minor siltstone embedded within (Beaulieu and Hughes 1975)(see definitions in sidebars and in Table 2). Landforms surrounding most of the South Slough shoreline and eastern portions of the lower bay are composed primarily of marine terrace deposits (Figure 5). The remainder of the lower bay is made up of eolian deposits (wind-generated deposits: in this case, dune sand) and beach deposits, while alluvial deposits (river-formed) are found under and along each major tributary to the Coos estuary. Man-made fill deposits can be found under most of the project area’s low-lying urban centers. The Coos Bay Coal Field (oriented north to south and roughly 30 mi long by 12 mi wide, overlaps the Coaledo formation), lies under North Bend, Coos Bay, Isthmus Slough and Catching Slough (and their tributaries), and the Lower Coos River, and extends down to the Coquille River (DOGAMI n.d.)(Figure 5). From the late nineteenth century through the mid-twentieth century extensive coal mining and geologic testing occurred in the Coos Bay Coal Field. Nearly 2.5 million tons of coal were extracted from this coal field between 1882 and 1918 (Duncan 1953; DOGAMI n.d.). Mining ceased in the 1920’s primarily due to competition from California fuel oils and higher grade coal from Utah and Wyoming (Duncan 1953; DOGAMI n.d.). Although coal mining no longer occurs in the project area, in the mid-2000s, portions of the coal field were explored to determine its potential for natural gas production using hydraulic fracturing techniques. 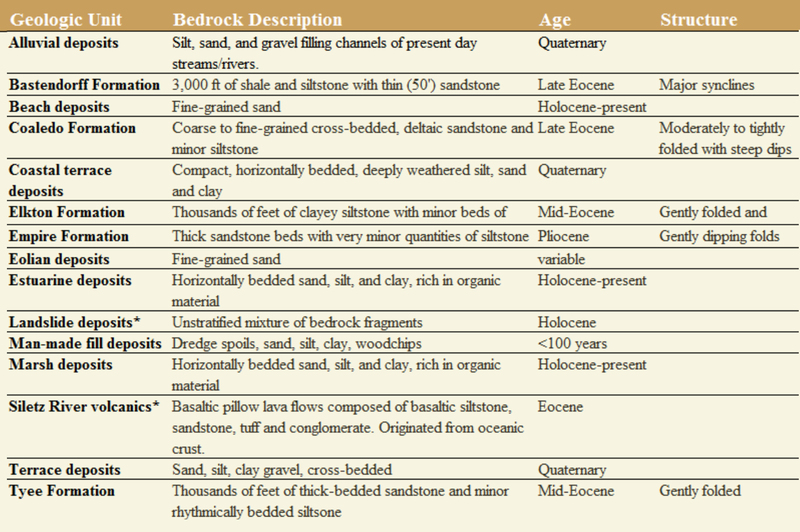 The project area is composed of bedrock formed in the Cenozoic era (65 million years ago-present), most of which was created during its Eocene epoch (Figure 6; Table 3). According to Rumrill (2006), sandstone, siltstone, and shale were deposited deep in the Pacific ocean and in shallow coastal waters over the past 50 million years, from the Eocene epoch through the Quaternary period. During the marine regression in the middle to late Eocene epoch (38-45 million years ago), sea level dropped, which allowed Coos Bay to emerge as a distinct, wave-dominated (as opposed to river-dominated) deltaic coastal basin. Beginning in the middle Eocene epoch (about 40-48 million years ago), sediments that largely form the present-day bedrock were laid down during repeating marine transgressions (period of high sea level) and regressions (period of low sea level)(Rumrill 2006). These fluctuations were caused primarily by cyclical changes in climate that led to advances and retreat of continental glaciers, and subsequent rise and fall of sea level. These periods of major seal level fluctuations caused the continental shoreline to migrate back and forth tens of kilometers between the sea level extremes. For example, beds of siltstone, mudstone, and sandstone formed in the middle Coaledo Formation beds (see “Formations” above) were laid down in deeper coastal waters during a marine transgression, while upper Coaledo beds (siltstone, mudstone, coal, and conglomerate) were deposited in shallow water during a subsequent regression (Rumrill 2006). According to Rumrill (2006), absence of sediments for nearly 30 million years, dating from the Oligocene and early Miocene (8-36 million years ago), indicates a significant period of non-deposition, probably related to a combination of the onset of “tectonic plate deformation along the Cascadia subduction zone”, glacial advance, and periods of low sea level. Rumrill (2006) discusses another gap of about four million years long occurring 6-2 million years ago, separating older formations such as the Miocene epoch’s Empire formation from more recent Pleistocene marine terraces and Holocene estuarine and sand deposits. 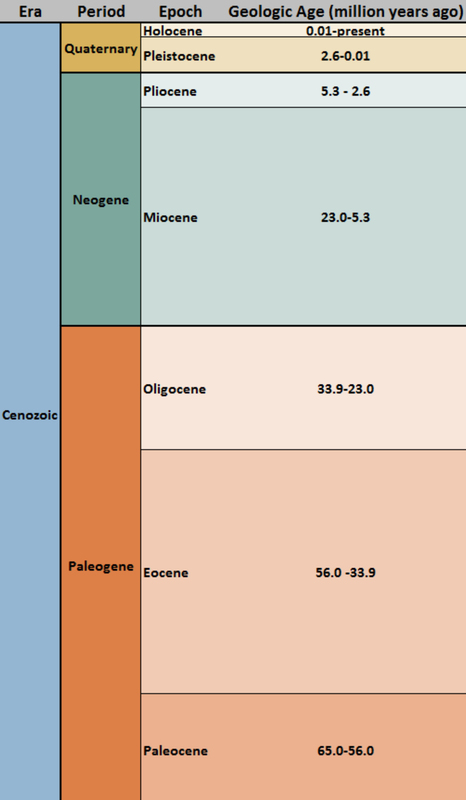 Table 3: Definition of geological ages in the Cenozoic era. This section discusses soil types found in the project area. Definitions of soil types discussed in this section can be found in Table 4. Sediments in the estuarine tidal channel vary from coarse-grained sand to fine-grained sand, silt and clay (Rumrill 2006). See “Sediment Composition” summary in “Chapter 10: Sediment” for more detail on estuary sediments. Tide flat sediments are primarily open sand flats and mudflats, which are composed of Udorthents, a combination of sand, silt, mud or organic materials, largely devoid of emergent vegetation (Haagen 1989). Mudflats typically occur in regions of the estuary that experience low tidal energy while sand flats occur in areas of high tidal energy (Rumrill 2006). In the South Slough estuary, sand flats frequently occur on the inside of major bends in the tidal channel. These sand flats frequently have sand ripples or waves, the patterns of which are directly related to water velocity (Rumrill 2006). According to Rumrill (2006) tidal beaches within South Slough are generally steep (9-15% slope) and sediments increase in mean grain size with depth, and decrease in mean grain size along the estuarine gradient (i.e., sediment is more fine further away from the mouth of the estuary). Most beach sediments are well-sorted. The decrease in mean sediment grain size along the estuarine gradient (from the high-energy estuary mouth to the low-energy upper estuary) is most likely a result of the gradual decrease in velocity of tidal currents, which in turn reduces their capacity to carry larger sediment particles (Arkett 1980, in Rumrill 2006). Soils in the tidal wetlands of the Coos estuary are predominately Fluvaquents-Histosols, which, typical of permanently or frequently saturated soils, are particularly rich in organic matter (Haagen 1989). Rumrill (2006) described surface soils within South Slough riparian areas, forested wetlands, and emergent freshwater marshes as typically sandy loams, also rich in organic matter. The Coos Bay Dune Sheet is a mass of sand that extends, unbroken but for the mouths of rivers and streams, from Haceta Head to Cape Arago, making it the largest dune sheet in North America and the only ‘oblique-ridge dune’ in the world (Cooper 1958; Crook 1979). Dune lands in Coos County are generally made up of DuneLand-Waldport-Heceta soil types. Extensive portions of the dunes have been stabilized by plantings of the invasive European beachgrass (Ammophila arenaria), which began in 1910 (for more information on this, see “Vegetation” summary in “Chapter 18: Non-Native/Invasive Spp.”). Fifteen principle soil types are found in the lower Coos basin (Figure 7). Of those, three predominate and are found in distinctly different areas of the landscape. Most common are Preacher-Bohannon loams (24% of total soil cover), found in a patchy, north-south oriented band of uplands east of the bay, along the western slopes and foothills of Blue Ridge, and in the Millicoma highlands. Templeton silt loam (23% of soil cover) extends from the uplands of the South Slough basin east through the drainages of Isthmus and Catching Sloughs, across the highlands of Pony Creek Reservoir, along the eastern slopes of Coos Bay and across the uplands between North Slough and Haynes Inlet. The Milbury-Bohannon-Umpcoos association (18% of cover) is interspersed with the Preacher-Bohannon series in the upper watershed. 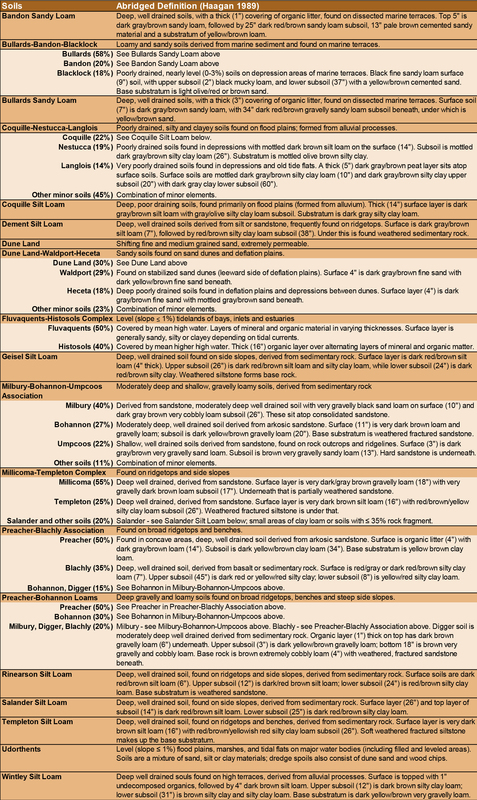 Except where otherwise noted, the following soil descriptions for several major sub-basins, are taken from an assessment of Coos estuary tributary basins conducted by the Coos Watershed Association (CoosWA 2006). North Slough differs in its soils from other sub-basins in that it is dominated by the very soft, highly erosive sandstones of Dune Land-Waldport-Heceta and Bullards-Bandon-Blacklock soils. 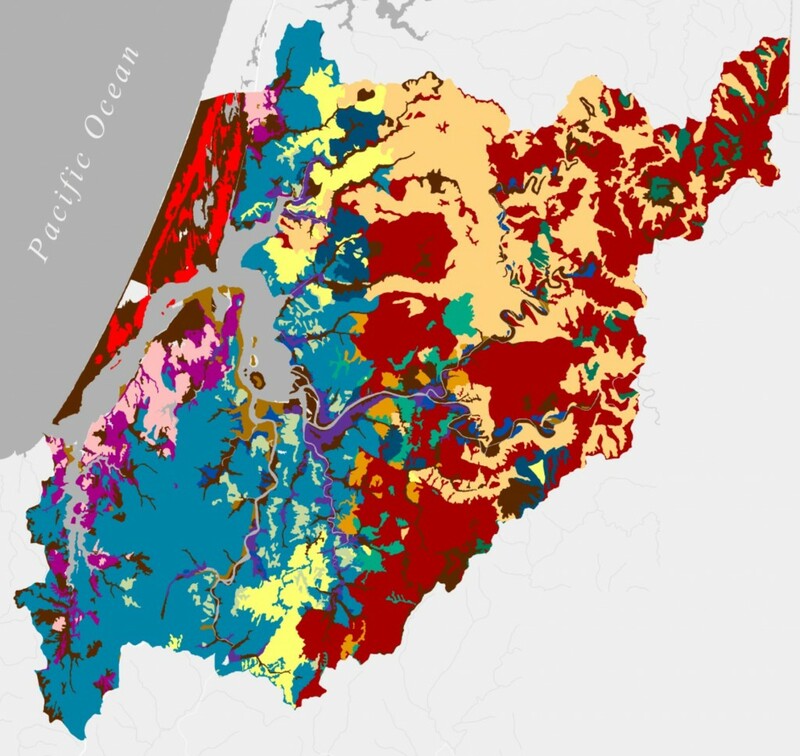 Three general soil types dominate the Palouse and Larson Slough sub-basin: Dune land-Waldport-Heceta, which is common to dune areas, Templeton and Salander loams, common to the lowland area, and Milbury-Bohannon-Umpcoos, found in the uplands. 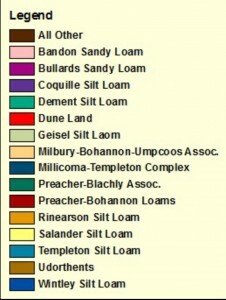 Soils in the Kentuck Slough sub-basin consist of Templeton and Salander loams in the lowlands, and Preacher-Bohannon loams in the uplands. The headwaters of Kentuck Creek are on the Milbury-Bohannon-Umpcoos soil type. 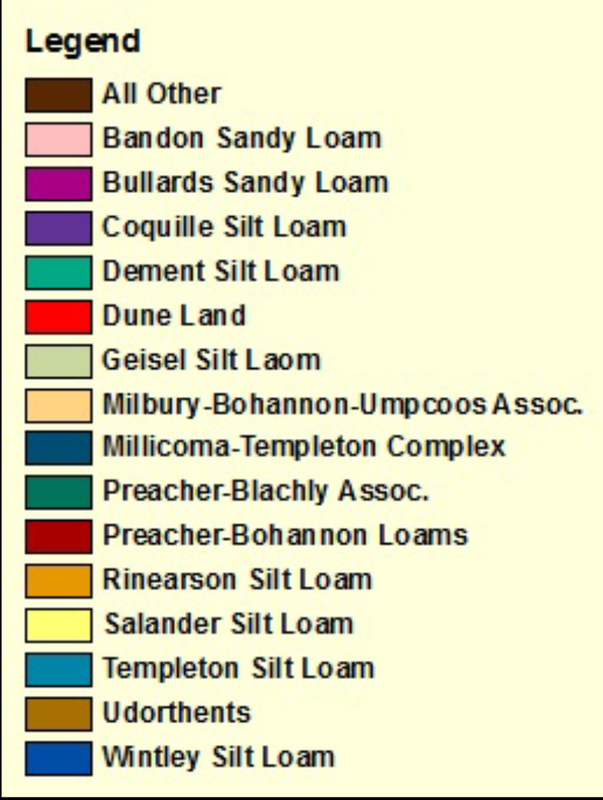 General soil types in the Willanch Slough sub-basin are Templeton and Salander loams (lowlands) and Preacher-Bohannon loams, (uplands). The Echo Creek sub-basin hosts three general soil types: the Coquille-Nestucca-Langlois soil, found in level areas, areas along the bay, and Coos River; Templeton and Salander loams (lowlands), and the Preacher-Bohannon loams (uplands). 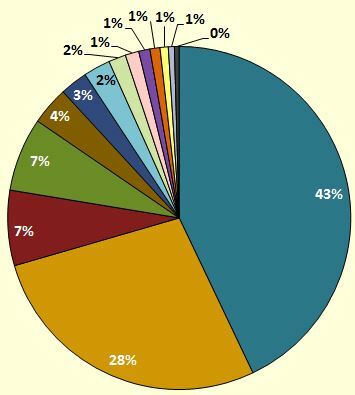 According to CoosWA (2008), Preacher-Bohannon loams are the most prevalent soils in Lower Millicoma and South Fork Coos River sub-basin. Other soils include Milbury-Bohannon-Umpcoos on steep slopes and poorly draining, clay Coquille-Nestucca-Langlois soils along floodplains. Haagen (1989) shows the primary soils in this sub-basin as Templeton loams, with some Bullards-Bandon-Blacklock group. Table 4: Most common soil types, soil complexes, and soil associations found in the project area. According to Wang et al. (2002), Oregon economic losses due to landslides exceed $10 million/year. In years with heavy storm events, losses can exceed $100 million. These losses are expected to increase as the state’s human population increases, expanding current land uses. Landslides occur frequently in the Coos region, as they do throughout much of the central Coast Range. 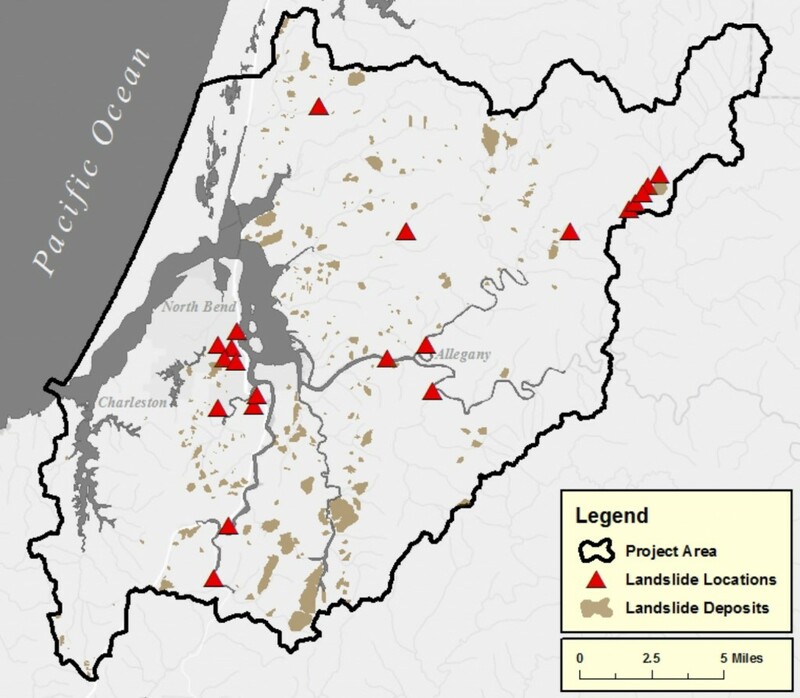 The Oregon Department of Geology and Mineral Industries (DOGAMI) has compiled an inventory of historic landslide locations, which helps identify areas potentially prone to future land failures (Figure 8). Oregon Department of Forestry (ODF) developed debris flow (a type of landslide – see Background below) hazard maps, based on slopes derived from USGS digital elevation models. Slopes >40% and an area greater than 150,000 ft2 were considered moderately hazardous. Tyee Formation slopes >65% over an area of 100,000 ft2 or >60% for more than ⅓ the total basin area were considered a high risk for debris flows. Other formations were considered a high risk if they had a slope >70% and an area exceeding 150,000 ft2 or ¼ total basin area. Extreme hazard values were assigned to locations where debris flows have occurred frequently over the past 35 years. Areas of high and moderate debris flow risk have been mapped for the project area using these data (Figure 9). The hills east of the main Coos estuary are at considerably higher risk for debris flow occurrences than lands closer to the ocean. 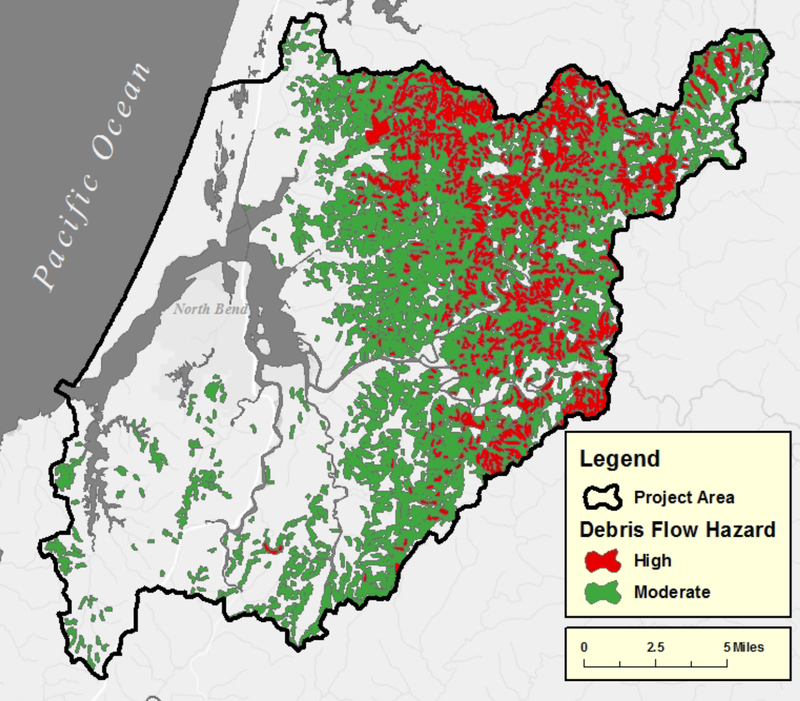 In fact, the Coos River subsystem has the highest percentage of both high (9.5%) and moderate (18%) lands at risk for debris flow events (Figure 10). When taken as a whole, 33% and 12% of the entire project area is at moderate and high risk, respectively, for debris flows. Rumrill (2006) describes the Coos estuary as being formed by the interactions of “several coastal geomorphic processes in the recent geologic past” (thousands to tens of thousands of years ago), including “slow coastal uplift and sudden subsidence” (driven by tectonic movement of offshore crustal plates); “regional transgression and regression of the sea as a result of ice-age glacial advance and retreat”; and “fluvial erosion of a major riverine drainage system caused by differential coastal uplift”. Long-term seismic shifting of the North America and Juan de Fuca plates contributed to east-west compression that formed the South Slough syncline and other folds throughout the southern Oregon coastal region. Folding and faulting cause different areas of the coast to rise at different rates, significantly altering the topography of the Coos drainage basin (Kelsey et al. 2002). For example, before the creation of the current coastal terraces (which were created by folding and faulting processes), the Coquille River drained into the Pacific Ocean through Isthmus and South Sloughs (Baldwin 1945; Nyborg 1993 as cited in Rumrill 2006). Evidence of this can be seen along several outcrops in the South Slough where Pleistocene alluvial floodplain materials (including aquatic invertebrate fossil assemblages) are identical to those found at the mouth of the Coquille River (Nyborg 1993 as cited in Rumrill 2006). Other evidence of subduction processes were described by Witter et al. (2003), who found that stepped marine terraces occurring in the hills surrounding the Coos estuary are a result of ocean-derived sediments scraped off the Juan de Fuca plate as it slid down under the North American Plate. Pressure that accumulates in the earth as a result of forces and movements of plates is released episodically during earthquakes. Three types of earthquakes affect coastal Oregon: Cascadia megathrust, deep intraplate, and crustal earthquakes (see sidebar). The most frequently occurring of these are crustal earthquakes, which occur along active fault lines (Rumrill 2006). 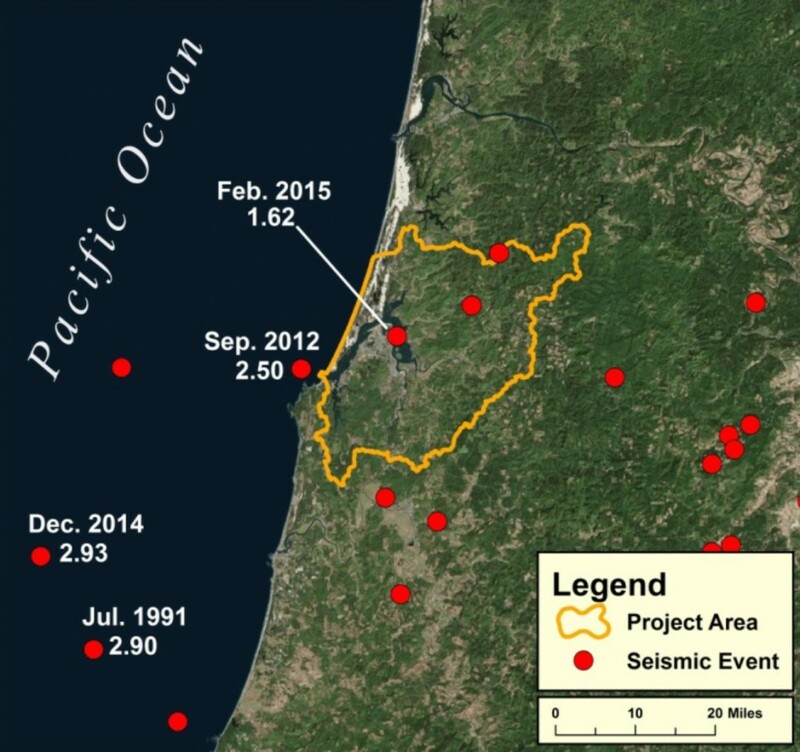 Seismic studies conducted near the Coos estuary’s Jordan Cove indicate fewer deep intraplate earthquakes occur in the Coos Bay area compared with areas to the north and south (GRI 2013). The largest earthquakes in our area tend to occur along the Cascadia Subduction Zone boundary and can cause sudden coastal subsidence of from 0.5-2 m (1.64-6.56 ft)(Darienzo and Peterson 1990 as cited in Rumrill 2006). According to NOAA’s Pacific Northwest Seismic Network (PNSN n.d.), the Cascadia Subduction Zone is locked by friction at depths shallower than 30 km (16.6 mi). Strain continues to build slowly as the tectonic forces act (including expansion at the Juan de Fuca Ridge). Eventually, when the frictional strength is exceeded, the plates will slip past each other, causing a megathrust earthquake. The fault’s frictional properties change with depth, such that immediately below the locked part is a strip (called the transition zone) that slides slowly and slips a few centimeters every year or so. These small slips relieve the stress on the plate boundary in one location, but add to the stress on the fault elsewhere. Below the transition zone geodetic evidence suggests that the faults slide continuously and silently past one another. Tsunamis are triggered when the elevation of the coastal margin suddenly changes, displacing a large volume of water. 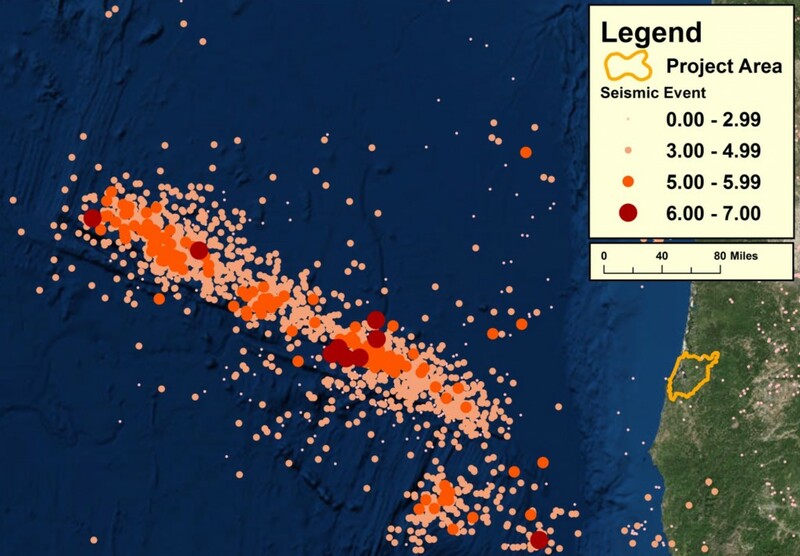 Tsunami waves propagate rapidly through the open ocean and can reverberate throughout the entire Pacific Ocean basin in the 24-hour period following a sufficiently strong earthquake. In the Pacific Ocean, tsunamis move at speeds of ~435 mph, losing little energy as they travel (Petroff n.d.). Geologists examined sediments deposited in the Coquille River estuary (Witter et al. 2003) and those of coastal lakes (Kelsey et al. 2005) for evidence of periodic tsunamis, and to improve their understanding of the impact of movements and interactions of crustal plates of the Cascadia Subduction Zone on the landforms and elevation of the southern Oregon coast, including the Coos estuary. Witter and colleagues traced 12 cycles of uplift and subsidence in the record of low-lying forests and tidal wetlands over the last 6,700 years while Kelsey and colleagues found a record of repeated local tsunamis in the sediments of Bradley Lake in Curry County. Figure 9: Distribution of lands that are highly or moderately at risk of debris flows in the project area. Data: ODF 2000. 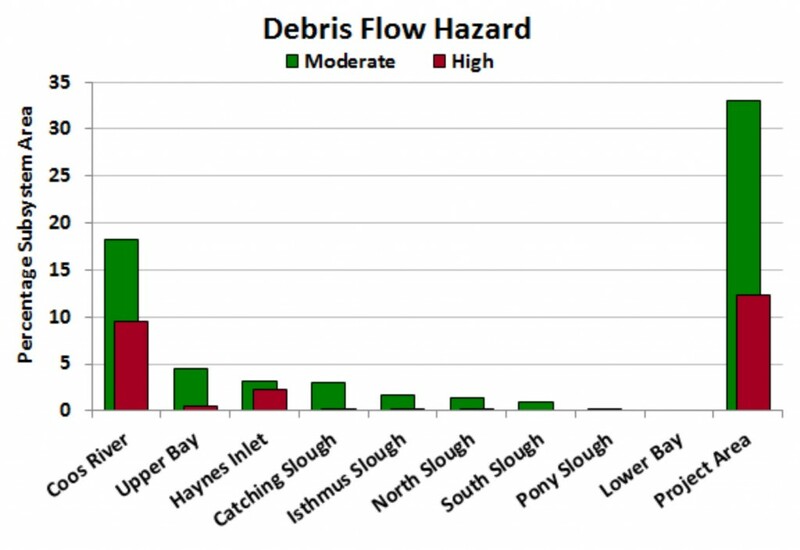 Figure 10: Percentage of each subsystem and entire project area that is at high and moderate risk for debris flow. Data: ODF 2000. According to Rumrill (2006), tide flats in the Coos estuary likely formed during the past 1,000-2,000 years as estuarine sediment eroded from marine terraces, filling in the Coos estuary tidal basin and creating the tide flats we see today. Other sources of tide flat sediments are terrestrial runoff, oceanic deposition, and biotic material (Rumrill 2006). For example, much of the mud, silt, and clay within the estuarine tidal basin enters South Slough from Coos Bay and the nearshore Pacific Ocean during flood tides (Wilson 2003 in Rumrill 2006). Sand flats are created largely from land sources, including erosion of nearby cliffs, then transported by high velocity tidal currents (Rumrill 2006). Tide flats are often highly channelized with shallow drainage channels, which facilitate a continued cycle of erosion and deposition as sediments are re-suspended, transported, and deposited with every tidal cycle (Rumrill 2006). Tidal wetland soils can inform us about sea level rise rates. For example, Rumrill (2006) explains that “Prevalence of peat layers in the upper 1.0-1.5 m (3.28-4.92 ft) of sediment cores taken from brackish marshes in many parts of the Coos estuary suggests a reduction in the rate of sea-level rise or an increase in the rate of sedimentation over the past 1,000-1,500 years”. Landslides are typically triggered by heavy rain. Less commonly they are caused by earthquakes, road construction, rapidly melting snow, or a combination of these and other events (DOGAMI 2008). A particularly damaging landslide is known as a debris flow. A debris flow (synonymous with mudslide, mudflow, or rapidly moving landslide) is a fast moving (exceeding 30 mph) mixture of water, rock, soil, and vegetation. Debris flows begin as small landslides, and then, upon entering a steep sloping stream channel, gain momentum and more debris, until they finally end as massive deposits at the outlet of the channel (DOGAMI 2008; ODF 2012). Debris flows can travel long distances, sometimes scour the channel down to bedrock, and frequently cause major structural damage to houses and roads. They are extremely hazardous, especially in populated areas (Robison et al. 1999; ODF 2012). It should be noted, however, that debris flows also deliver large wood to streams where they add complex structure that provide high quality fish habitat (ODF 2012). In 1996, two very large storms severely affected western Oregon, one of which was a 100-year rain event that set an all-time one-day precipitation record at North Bend (6.67 inches in 24 hrs)(Robison et al. 1999). 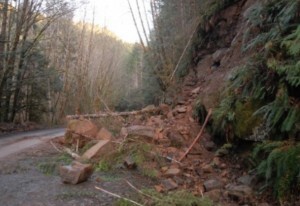 Both storms triggered large numbers of landslides in western Oregon, prompting ODF to take a closer look at activities, such as forest-road building and logging, that were thought to play a role in landslides. This report (Robison et al. 1999) examined eight locations affected by these two storms and found that lands with the highest hazards for landslides were found on slopes >70-80% steepness (depending on surface geology and landform). For example, Tyee Core formations are very susceptible to debris flows generally due to steep slopes, shallow low-cohesion soils, with an impermeable layer beneath. Lands with moderate hazard were found on slopes 50-70%. In addition, concave shaped landforms with large drainage areas were most frequently associated with landslides. Robison et al. (1999) determined that forest cover and time since last timber harvest also influenced landslide occurrence, with lands 0-10 years post-harvest being most susceptible to landslides. However, forest stand age did not appear to affect the size of landslides. Further, road-associated landslides were found to be four times larger (volume of earth moved) than landslides not occurring near roads. Landslides associated with abandoned logging roads (“legacy” roads) were smaller in size than those associated with active logging roads. Roads where drainage water was diverted (e.g., culvert or other relief structure), had higher landslide occurrences if the water exited on fill slopes. Roads carved out of slopes often deposit excavated fill on the downslope edge of the road, further influencing landslide hazards. Rain-induced landslides are also thought to be more frequent during La Niña years, when the Pacific Northwest experiences increased storminess, increased precipitation and more days with measurable precipitation (UO 2012; NOAA 2002). Tectonic Plate – The rigid outermost shell of the planet (crust and upper mantle), is broken into major (e.g., continental plates) and minor tectonic “plates”. Ocean Ridge – Underwater mountain range formed by rising magma in a zone on the ocean floor where two tectonic plates are moving apart. Subduction Zone – An area where two tectonic plates converge causing one plate to slide beneath the other. 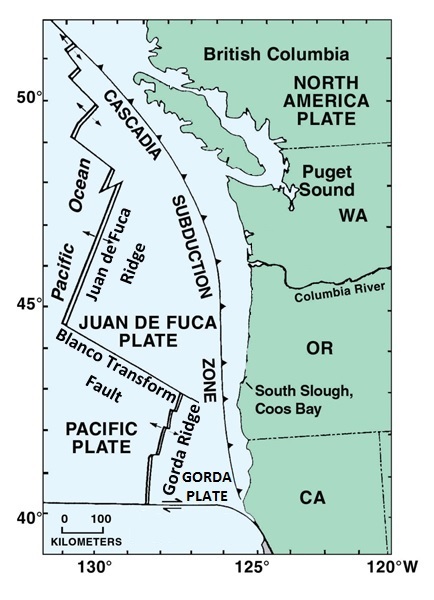 Cascadia Subduction Zone – The area where the Juan de Fuca Plate slides beneath the North American Plate. Faults – Fractures in the earth’s crust caused by compression, tensional, or shearing forces, often associated with the boundaries between tectonic plates. Slip or Strike-slip Fault – Vertical fractures in the earth’s crust where the blocks of land have mostly moved horizontally. Sources: USGS 2014a; DOGAMI 2009; PNSN n.d.
A geological formation is a rock unit that is distinctive enough in appearance that a geologic mapper can tell it apart from the surrounding rock layers. It must also be thick enough and extensive enough to plot on a map. 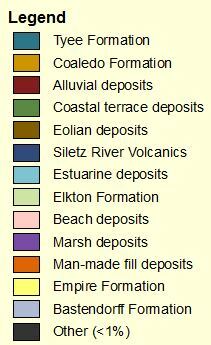 Geologic deposits (superficial) are recent (quaternary: 2.6 million years old or less) unconsolidated sediments, soil or rocks added to a landform, generally named according to their origin (e.g., beach deposit, landslide deposit). Older deposits are referred to as bedrock. Sandstone (sometimes known as arenite) is a medium-grained sedimentary rock composed primarily of minerals or rock grains cemented together. Siltstone is sedimentary rock made up of cemented together silt particles, similar to shale, but does not demonstrate fissility (breaking along planes into sheets). 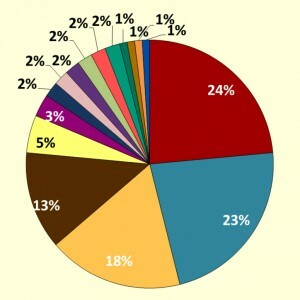 Span of time since the Earth’s creation, divided by major geological events, strata composition, or radiometric dating. Eon is the largest division, followed by Era, Period, Epoch and finally Age. Soil complex is defined as two or more soils which are so integrated that they cannot be separated at the map scale. Soil association is defined as two or more soils that are intricately mixed but could still be separated at the map scale (although it’s not practical to do so). Cascadia Megathrust – The most powerful recorded earthquakes in the area (magnitude 8-9 or higher), Cascadia megrathrust earthquakes are caused the by sudden release of built-up energy when the Juan de Fuca Plate (locked against the North American Plate) is suddenly released and the plates slip past each other. Deep Intraplate – Deep intraplate earthquakes occur when the Juan de Fuca plate cracks as it is bent deep underneath the North American Plate (at depths from 30-70 km [19-43 mi]). Deep intraplate earthquakes occur about every 30 years at magnitudes as high as 7.5. Because they usually occur under the Cascade and Coastal ranges, these earthquakes can be the most damaging to population centers. Crustal – Crustal earthquakes occur on shallow faults (to 35 km [22 mi] deep) in the North American Plate and are relatively common off the southern Oregon coast (maximum magnitudes <7). Earthquake Magnitude (i.e., strength), originally based on the Richter Scale but now based on the moment magnitude scale (MMS), quantifies the energy released by an earthquake. Arkett, S. A. 1980. Vertical and horizontal distributions of major meiofauna taxa on selected beaches in the South Slough estuary, Charleston, Oregon, U.S.A. Master’s thesis, University of the Pacific. 67 pp. Baldwin, E. M. 1945. Some revisions of the Late Cenozoic stratigraphy of the southern Oregon Coast. Journal of Geology 52: 35-46. Beaulieu, J. D., and P. W. Hughes. 1975. Environmental geology of western Coos and Douglas Counties, Oregon. Portland: State of Oregon, Dept. of Geology and Mineral Industries. Clague, J. J. 1997. Evidence for large earthquakes at the Cascadia subduction zone. Reviews of Geophysics, 35(4), 439-460.
Cooper, W. S. 1958. Coastal Sand Dunes of Oregon and Washington. Geological Society of America, New York. Coos Watershed Association (CoosWA). 2006. 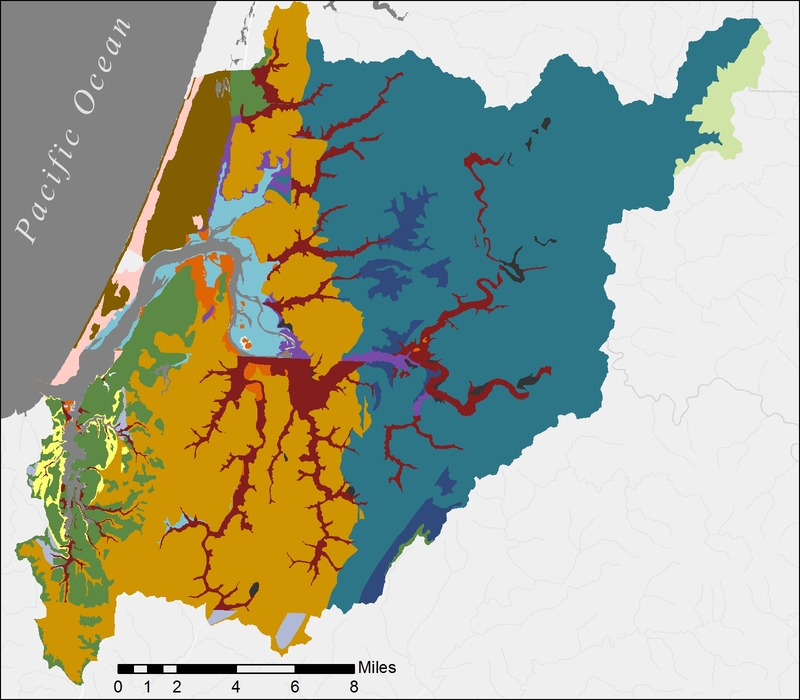 Coos Bay Lowland Assessment and Restoration Plan. Coos Watershed Association, Charleston, Oregon. 268p. Coos Watershed Association (CoosWA). 2008. Catching Slough, Daniel’s Creek and Heads of Tide Sub-basin Assessment and Restoration Opportunities. Coos Watershed Association, Charleston, Oregon, 160p. Crook, C. S. 1979. A system of classifying and identifying Oregon’s coastal beaches and dunes. Oregon Coastal Zone Management Association, Inc., Newport, OR. Darienzo, M. E. and C. D. Peterson. 1990. Episodic tectonic subsidence of late Holocene salt marshes, northern Oregon central Cascadia margin. Tectonics 9: 1-12. Duncan, D. 1953. Geology and Coal Deposits in Part of the Coos Bay Coal Field, Oregon: A contribution to economic geology. Geological Survey Bulletin 982-B. Department of Interior, U.S. Geological Survey, Washington D.C.
Kelsey, H. M., R. C. Witter, and E. Hemphill-Haley. 2002. “Plate-boundary earthquakes and tsunamis of the past 5500 yr, Sixes River estuary, southern Oregon”. Geological Society of America Bulletin, 114(3), 298-314. Komar, P. D. 1997. 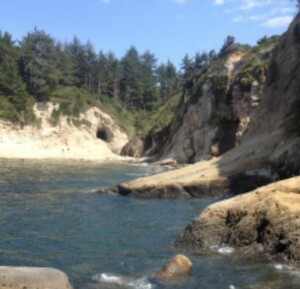 The Pacific Northwest coast: living with the shores of Oregon and Washington. Duke University Press. Leonard, L. J., R. D. Hyndman, and S. Mazzotti. 2004. “Coseismic subsidence in the 1700 great Cascadia earthquake: Coastal estimates versus elastic dislocation models.” Geological Society of America Bulletin 116(5/6): 655-670. McInelly, G. W., and H. M. Kelsey. 1990. “Late Quaternary tectonic deformation in the Cape Arago-Bandon region of coastal Oregon as deduced from wave-cut platforms.” Journal of Geophysical Research 95(B5): 6699-6713. Nelson, A. R., A. E. Jennings, and K. Kashima. 1996. An earthquake history derived from stratigraphic and microfossil evidence of relative sea-level change at Coos Bay, southern coastal Oregon. Geological Society of America Bulletin 108(2): 141-154. Nelson, A. R., Y. Ota, M. Umitsu, K. Kashima, and Y. Matsushima. 1998. “Seismic or hydrodynamic control of rapid late-Holocene sea-level rises in southern coastal Oregon, USA?.” The Holocene 8(3): 287-299. Nyborg, T. 1993. 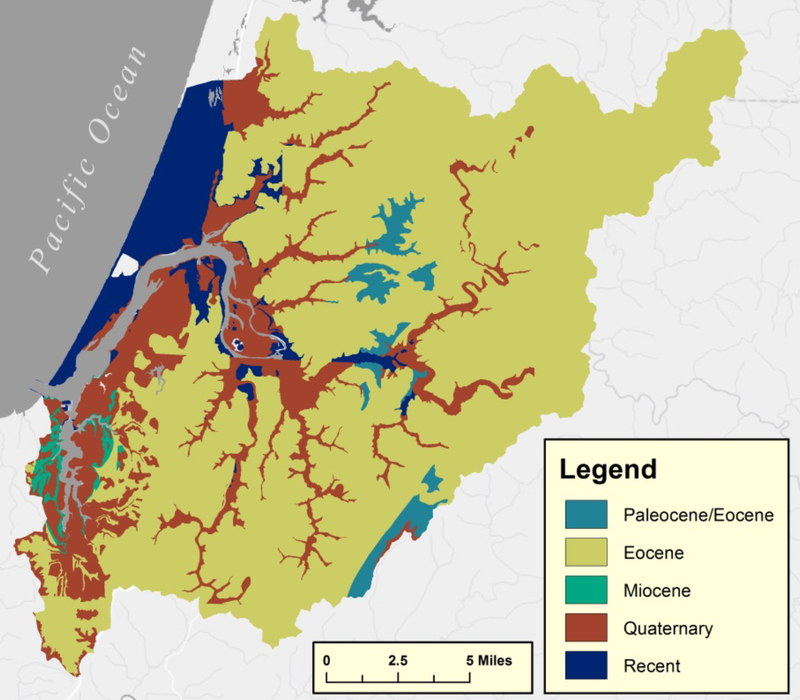 Investigation into the geology and paleontology of the South Slough National Estuarine Reserve, Coos County, Oregon. OIMB Student Report, Charleston, OR. 52 pp. Robison, G., K. Mills, J. Paul, L. Dent, and A. Skaugset, 1999. Storm Impacts and Landslides of 1996: Final Report. Oregon Department of Forestry. Forest Practices Technical Report No. 4. 157 pp. Rumrill, S. 2006. Ecology of the South Slough Estuary: Site profile of the South Slough National Estuarine Research Reserve. South Slough National Estuarine Research Reserve 259 pp. Satake, K., K. Shimazaki, Y. Tsuji, and K. Ueda. 1996. Time and size of a giant earthquake in Cascadia inferred from Japanese tsunami records of January 1700. Nature, 379(6562), 246-249. Geotechnical Resources Inc. (GRI). 2013. Site-Specific Seismic Hazard Study for the Proposed Jordan Cove LNG Facility, Coos County, Oregon. Beaverton, OR. U. S. Department of Agriculture (USDA). 2000. Soil Survey Geographic (SSURGO) Database for Coos County, Oregon. U.S. Department of Agriculture, Natural Resources Conservation Service, Fort Worth, Texas. Wilson, C. 2003. Erosion and transport of fine sediments from watersheds tributary to NERR estuaries. Ph.D. thesis, Case-Western University. 156 pp. Witter, R. C., H. M. Kelsey and E. Hemphill-Haley. 2003. Great Cascadia earthquakes and tsunamis of the past 6700 years, Coquille River estuary, southern coastal Oregon. DOI: 10.1130/B25189.1 Geological Society of America Bulletin 2003;115, no. 10;1289-1306. Witter, R. C., Y. Zhang, K. Wang, G. R. Priest, C. Goldfinger, L. Stimely, J. T. English, and P. A. Ferro. 2011. Simulating Tsunami Inundation at Bandon, Coos County, Oregon, Using Hypothetical Cascadia and Alaska Earthquake Scenarios, DOGAMI Special Paper 43.